‘Had such a wonderful time with such a precious group of people coming together, creating an amazing joyful atmosphere. 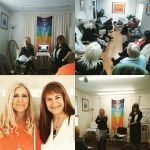 The workshop was well delivered creating a blissful magical day, much love to Sonya and Ella. Thank you.’ Jeanette. ‘Today has been thoroughly thought provoking, inspiring and motivating in a positively, humorous and sensitive way. Fun, laughter, friendship, all the time and beautifully presented. Thank you.’ Tracy. ‘The workshop was amazing. I now feel very positive and relaxed. 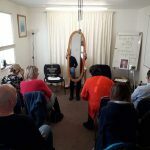 I loved the ‘I am’ ‘exercise and the circle of life. It made me realise which part of my life I need to work on. The music was very up lifting. Thank you so much for a great day of learning how to be the best person of myself and follow my dreams. Thank you again.’ Sophie. ‘I have just had the most fantastic day and made lovely new friends. I came wondering what it was all about. Met with nine friendly people. I was partnered with Jeanette whom I felt I had known all my life, a lovely pleasant kind soul. It was such a relaxing experience and I felt everyone was there for the same reason. Sonya and Ella really pushed the boat out and really helped every one of us. Thank you.’ Evelyn. 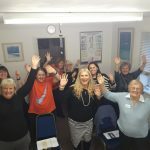 ‘I enjoyed a most lovely time at this happy workshop. Lovely people to get to know. New friends to be made. A lot of hard work by two amazing people.The atmosphere was so relaxing. 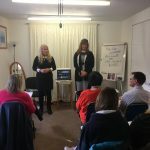 I would love to be involved in more workshops like this one.Thank you for making me feel better and more motivated to get on with life and enjoy every day we are given. Reality only exists because these two lovely people have focused it into being. Thank you.’ Doris. ‘Ella and Sonya are very good as a team. It was a fun and insightful day with identifiable funny and sad stories told. I learned how to love myself and ‘just be.’ I now know what I need to do and have looked at how my life is balanced and un-balanced in areas. I met some lovely people. Thank you.’ Margaret. 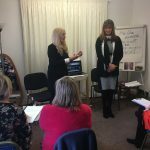 ‘What a fantastic workshop. Ella and Sonya were good, funny and exciting. The workshop was easy to understand, simplicity comes to mind. I learned to love myself, facilitate. I would recommend any person to come and experience this work shop. Met some lovely people.Thank you.’ Lorraine. ‘I didn’t know what to expect from the day which was good, as I would have been scared of coming alone as I don’t like to look at myself. However in coming along it made me do this. I was so thankful I did. There were powerful sessions that made me self-reflect & discover where I am and who I want to be with. There were a lot of inspirational words to take away and I feel like I have made friends within the group who were lovely and friendly. Great facilitators who made me feel safe in opening up. There was lovely relaxing music along with inspirational music at the end. Best being partnered in the sessions with a stranger rather than a friend.Thank you.’ Lisa. ‘I’ve had a lovely day and feel happier than when I came this morning.You have made me feel really comfortable and at home. I will look after myself with a different light now because I now know I am important. It was nice to meet new people.Thank you for having me.’ Kim.